Thank you to Martyn Cambridge for the following memories of Force Rugby. Bill Rowlands ( who died recently) told me he was in the original game in 1948 and how it was an honour to represent the force at the game which at the time was all about the friendship. There was always a social get together after the game ( think he meant a few beers ) and there were always the antics they got up to after the game. How basic the game was then compared to the game today, yes it was hard and you always wanted to win, the friendships you made amongst other forces and civilian teams you played against were legendary. Bill said at one stage all the fun had gone out of the game and it was almost as if you had to win at all costs. Even if you were the third or fourth reserve and you failed to turn up on match day you were summoned to appear before the Assistant Chief Constable Mr Carter and explain why you failed to do so. Gloucester always had Gloucestershire police officers in the team and back in the 1950’s the whole of the Gloucester front row were police officers Alan Wadley,Cyril Thomas and Jack Watkins. Teams such as Cinderford, Lydney, Cheltenham and Stroud all had police officers in their teams along with many local clubs. 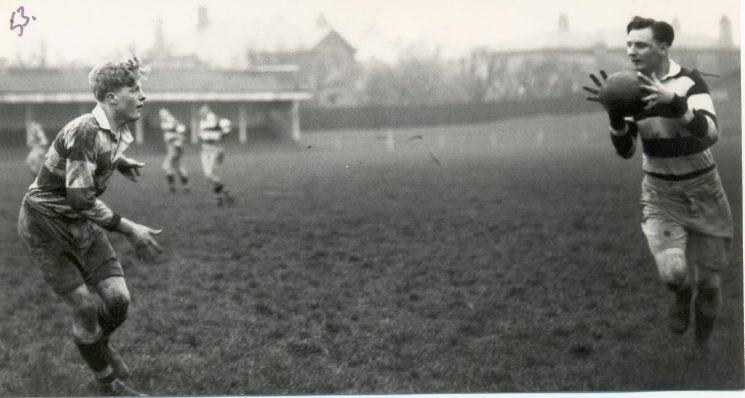 Ivor Jones captained the Gloucester United side for 10 years and many years later Jerry Herniman also captained the side. David Jones,Richard Jardine, John Fidler Ronnie Etheridge, Steve Clewes are but a few who played for Gloucester. With the advent of the professional game Simon Morris was the last Gloucester police officer to play for Gloucester. As was normal you played in your own time except, as stated in Standing Orders, when it was in the Police Athletics Association cup if it was a home fixture you had 4 hours time off or 8 hours if it was an away game. Next year will be the 60th anniversary of Gloucestershire Police RFC and if there is enough interest Martyn is talking about organising what may be the last reunion, probably be in June. Although this is titled the 60th Anniversary of force rugby we do have photographs dating from the 1920s. This page was added on 27/11/2017. Martin has failed to mention, what, for many will be the highlights of our connection with the Force Rugby team. Namely, the tours to exotic locations such as 1982 to Bermuda, 1986 to Hong Kong and 1993 to Singapore. Each tour was highly successful and great hospitality was provided by the host Forces.